From left: Peter Spirgel, managing partner of Flaster/Greenberg, presenting sponsor for the Outlook; Mitchell Cohen, Esq., Counsel & Co-Chair, Alternative & Renewable Energy Industry Group, Flaster/Greenberg P.C. ; Ralph LaRossa, President and COO, PSE&G Inc.; Deborah DiLorenzo, president, Chamber of Commerce of Southern New Jersey; Wendell Pritchett, Chancellor, Rutgers-Camden; Michael Flett, President & CEO, Flett Exchange LLC; and program moderator Richard Michelfelder, Ph.D., Clinical Associate Professor, Rutgers School of Business–Camden. 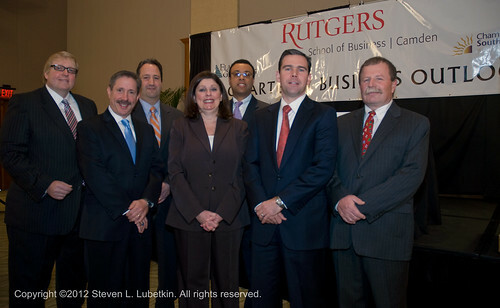 Lubetkin Global Communications LLC is pleased to present the First Quarter 2012 Rutgers University School of Business at Camden Quarterly Business Outlook. In this program the Outlook departs from its past format and focuses entirely on the topic of Green Energy. Mitchell Cohen, Esq., Counsel & Co-Chair, Alternative & Renewable Energy Industry Group, Flaster/Greenberg P.C. Ralph LaRossa, President and COO, PSE&G Inc. This quarterly forum, presented by Rutgers University in cooperation with the Chamber of Commerce of Southern New Jersey and sponsored by the law firm of Flaster Greenberg, features South Jersey area business leaders who assess the Southern New Jersey economy in their business sectors. This program was recorded on Thursday, January 26, 2012, at the Student Center of Rutgers-Camden.